Football Shaped Cockpit Bag -- One Design Sailboat Covers -- The Sailors Tailor, Inc.
Never lose anything again, even after capsize, with this handy bag that HOOKS in the cockpit or to your trampoline. Water repellent bag has easy open nylon zipper. 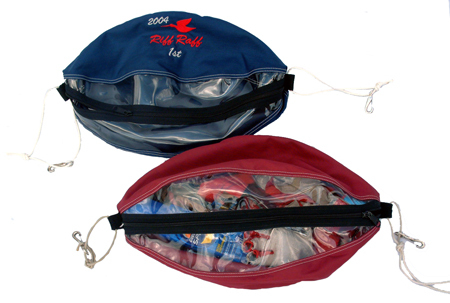 Clear plastic panels above and below zipper allow you to easily see and grab what is in the bag. Bag is 17" long and includes tie cords and hooks. Assorted colors.